MotoGP™ riders were the first on track on Friday due to Qatar’s unique schedule with Iannone topping the session from Marquez and Redding. 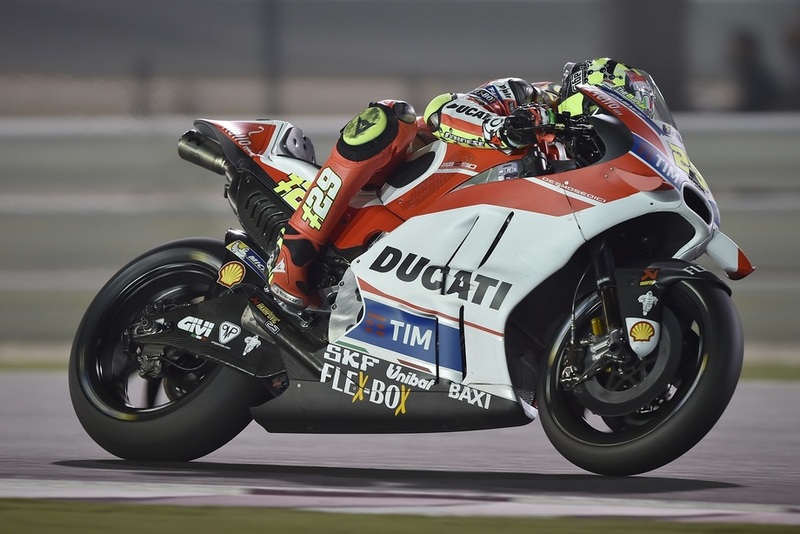 With both ground and air temperature in the mid 20s, riders took to the circuit for their second session of the Commercial Bank Grand Prix of Qatar. It was Jorge Lorenzo (Movistar Yamaha MotoGP) who topped the time sheets with a lap of 1’55.440 during FP1, both Valentino Rossi (Movistar Yamaha MotoGP) and Andrea Iannone (Ducati Team) behind. After a difficult first day the Repsol Honda Team duo of Dani Pedrosa and Marc Marquez were amongst the first to leave the pits as Lorenzo once again waited for everyone else to depart before heading out. Within the first ten minutes times were already faster than they had been the previous day, Iannone setting a 1’55.388 to top the session. This time would go unbeaten as the Italian proved the 2016 Desmosedici GP is a real contender. The Italian’s time was the fastest lap of the Grand Prix weekend so far. 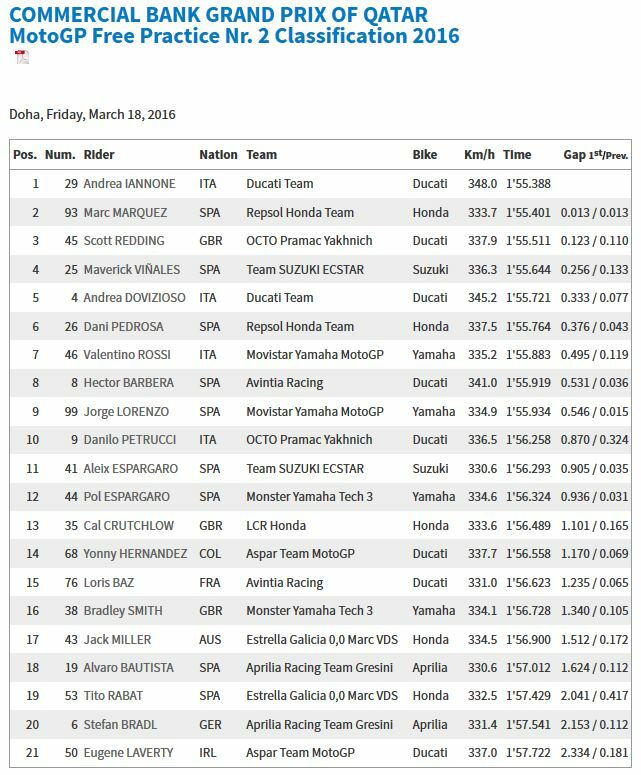 The situation also looked much better for Marc Marquez, the Honda rider able to set the second fastest time of the session and end 0.013s back on Iannone. Marquez’s time was over a half second faster than his best Thursday time. A late charge saw Scott Redding (Octo Pramac Yakhnich) move up to third with a 1’55.511, almost a full second faster than his FP1 time. Redding is back to his best and has looked confident and competitive in each session since stepping onto the GP15. 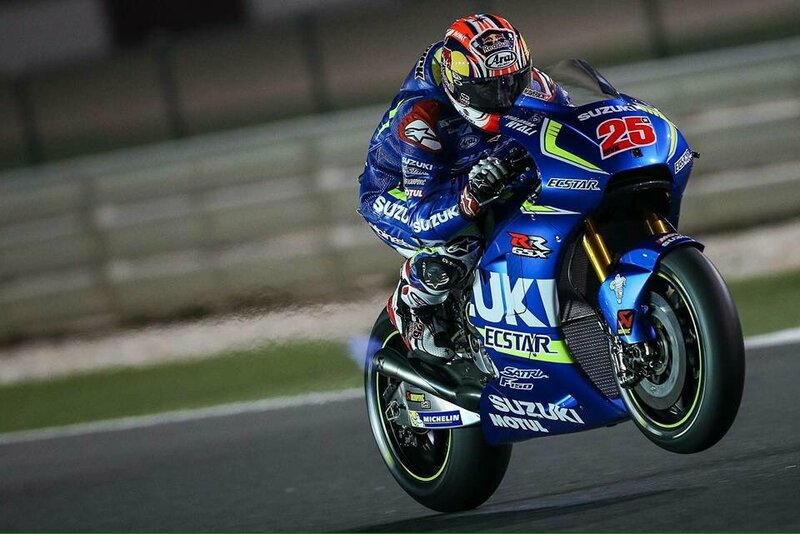 Rising star Maverick Viñales (Team Suzuki Ecstar) continued to deliver on all the promise of testing as he ended fourth and a mere 0.256s behind Iannone. Andrea Dovizioso (Ducati Team) made it two factory Ducati machines inside the top five. Dani Pedrosa (Repsol Honda Team), Valentino Rossi (Movistar Yamaha MotoGP), Hector Barbera (Avintia Racing), Jorge Lorenzo (Movistar Yamaha MotoGP) and Danilo Petrucci (Octo Pramac Yakhnich) completed an incredible top ten. All of the top 12 MotoGP™ World Championship riders were within 0.936s of each other as the new technical regulations have created one of, if not the, most competitive fields in recent years. Cal Crutchlow (LCR Honda), Bradley Smith (Monster Yamaha Tech 3) and Aleix Espargaro (Team Suzuki Ecstar) are some of the riders who will be looking to improve and end FP3 inside the top ten or risk having to battle through Q1 on Saturday. There was a fall for Crutchlow at Turn 16, losing the front on corner entry. Loris Baz (Avintia Racing) also suffered a heavy fall at Turn 14, both riders were unhurt.